In order to be able to do harder division problems, we need to review what the names of each part of a division problem are called. - Division Games: There are A TON of division games here to practice your division and fact families. - The Quotient Cafe: Help the customers divide the food evenly among themselves. - Snork’s Game: Can you help the lovable monster named Snork learn how to do long division? - Who Wants To Be A Hundredaire: Is that your final answer? Get them right and you could win big! - Tic Tac Toe: Use your knowledge of division to get three in a row! Can you win the day? 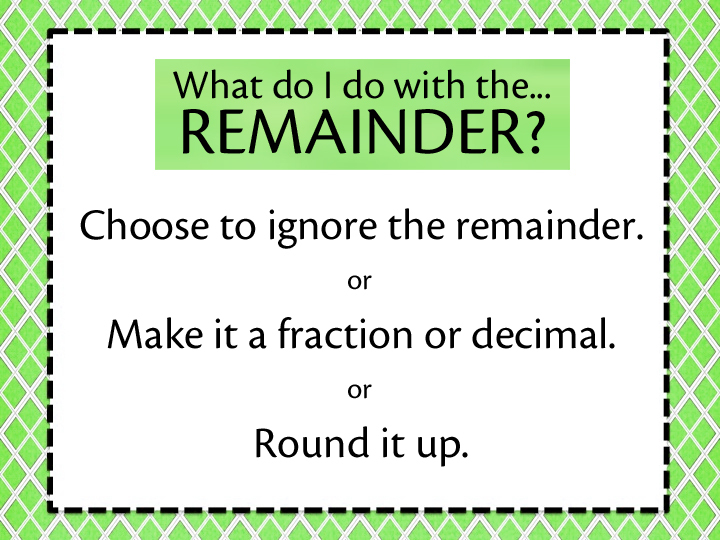 - Time for Remainders: Help the math tutors solve these word problems and save the day! - Practice Problems: Can you solve all these practice problems of division story problems? - We Built This City: Can you figure out what to do with the remainders and build the city?